With the release of the Paralda air purifier, we've begun redesigning air purification! With the Paralda air purifier you can breathe the cleanest air possible without sacrificing the style of your home. Named after the elemental king of air, the new Paralda air purifier is redefining air purification with its design, function and ecological commitment. The Paralda air purifier has multi-filtration technology contains HEPA filtration, an ozone safe Ionizer and a long-lasting ultraviolet light. The HEPA filter in the Paralda air purifier has been tested to remove 99.42% of airborne particles like dust, dust mites, pet dander, mold spores and pollen. The long-lasting UV light in the Paralda air purifier has proven to eliminate 98% of airborne bacteria and viruses. The Paralda air purifier combines the ozone-safe ionizer which promotes an environment of health and rejuvenation. The Paralda air purifier is green - literally. The translucent exterior poetically suspends the bamboo green interior portraying a feeling of freshness. 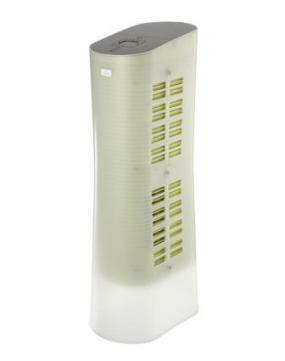 The Paralda air purifier is also green, in design; it's RoHS compliant, Energy Star qualified and ozone safe. Room Size: For use in bedrooms, family rooms, offices - Best performance up to 400 sq.ft.